It all started with a dream. You felt the call first, followed by the initial rush of terror, doubt, and suspicion. Am I really the guy for this? It then transformed into excitement, rippled out of your home across your church, and ultimately materialized into a small group of folks ready to jump on board with you – the launch team, you called them. You what-if’ed, you planned, you cast vision, you prayed, you put together a church planting prospectus. You got that graphics guy your friend’s cousin knew to design a logo. And then reality hit; this thing is going to cost some money. At the counsel of friends and the elders of your sending church, you began putting together a list of churches, families, and friends who could help kick start this thing. You prayed and cast vision and planned some more, and by God’s grace, He provided several external supporters to fund the first few years of your church plant. It’s go time! It seems like you just got this thing off the ground. How are you already at this milestone? You look at your external support compared with your internal giving and you wonder… is this doable? This is exactly the milestone that confronted us just months ago. We looked around at the young families, college students, and a handful of empty nesters that constituted our church family and wondered, can we really afford for this support to drop off? Our plan from the outset was to recruit supporters who began supporting us in a staggered manner, so as to ease off the external support on the backside of those first few pledged years. As those supporters dropped off – like rocket boosters dropping off a spacecraft – we made up some of the financial ground, but not at the pace we needed to become fully self-sustaining. Are we headed to disaster? We asked ourselves again and again. 1 - We prayed. Our pastor team, financial advisory team, and basically any other group of living, breathing Christian we knew got behind this transition in prayer. We asked God to provide. 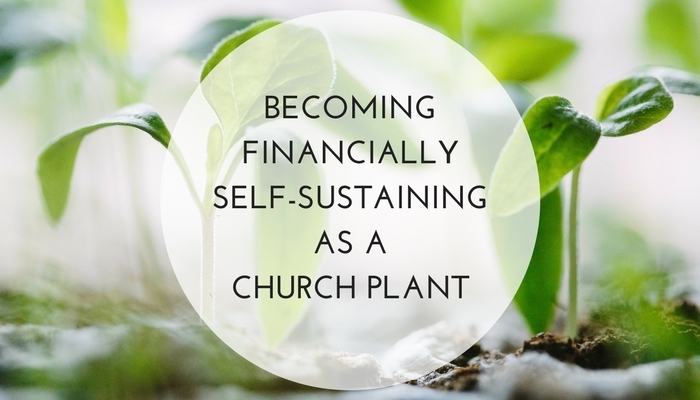 We asked the Lord to make us a self-sustaining, financially secure body of believers. We approached God in confidence, on the basis of Jesus’ work for us, with the knowledge that God owns the cattle on a thousand hills and delights in giving good things to His children. 2 - We reviewed our budget. What areas in the budget could we tighten the belt to prepare for this transition? Are there any places where were spending frivolously, being lazy, or presumptuous? Dave Ramsey has spoken of the most common mistake made by young married couples stepping out on their own: buying the same fridge as their parents. By this he means that young married couples carry expectations about what life should look life for them, not realizing that it took their parents a lifetime of savings, discipline, and wise stewardship to afford that fancy fridge that makes ice (my wife and I still dream of that day). In many respects, church planters can be guilty of the same mistake; expecting ministry to take the same shape as their sending church, without realizing much of their ministry is building on years of savings, discipline, and wise stewardship. Consider whether this could be true of you. 4- We asked for help. I mean this in two ways. First, we simply asked our folks to step up the plate and help shoulder the church financially. Leadership books talk about having a compelling vision and winning over the crowds, calling those we lead to change the world. But our church family was just worried about keeping their kids alive and maintaining some semblance of sanity. So the pastors simply asked our church family for a hand. We asked them to consider whether or not they could pitch in a little bit more to help. And they did. In general, we’ve found folks consider a request for a hand more compelling than a world-beating call to arms. 5- We celebrated this as a milestone. This is an important transition as a church and we celebrated it as such. We made it three years. We saw God do amazing work in our body. We could not be more elated about all God has done and continues to do, and that God has allowed us to make it this far. We celebrated this milestone as a blessing, that important rite of passage we embrace on the path towards long-term viability. At our family meetings, we made it a point to rejoice and thank God for getting us over this threshold. 6 - We trusted Jesus. Jesus builds his church. For all this talk of becoming “self”-sustaining, we had to discipline ourselves to remember that all good gifts come from God’s hands. [quote]For all this talk of becoming 'self'-sustaining, we had to discipline ourselves to remember that all good gifts come from God’s hands. [/quote]And this was (and still continues to be) an opportunity to learn trust. Jesus will build his church. Even if our church fails, God has purposed to do what He planned from eternity past – to be adored by His people, whom he secured by His own blood, from every tribe, tongue, and nation. By God’s grace, we transitioned from external support to maintaining our budget from internal support. We’ve still got a good deal to learn as leaders, husbands, fathers, and pastors, but we’re thankful God has allowed us to be a part of His work these last three years. It was bumpy, imperfect, and not quite as sharp as it could have been, but that’s just the reality of planting a church, isn’t it?